Is Paint and Primer in One Worth It? Do You Need to Clean Walls First? Grabbing a brush and paint sounds simple, doesn't it? 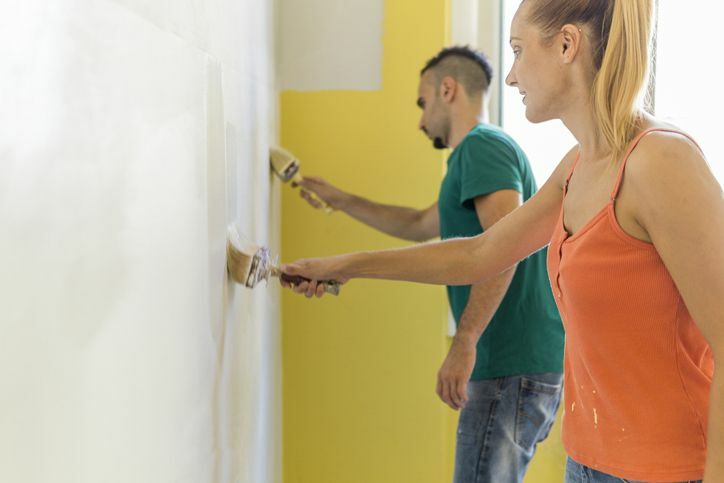 Painting walls is by far the most common DIY home improvement project–so common that almost everyone thinks they know exactly how to do it. Professional painters, however, know that it's not as simple as it first looks and that there are proper techniques (especially for bathrooms) that make the job faster and give you much better results. So, let's learn the secrets of the pros. Yes, there is a right way to load paint onto the brush. But first, let's talk about the very basic matter of carrying the paint around you as you paint. 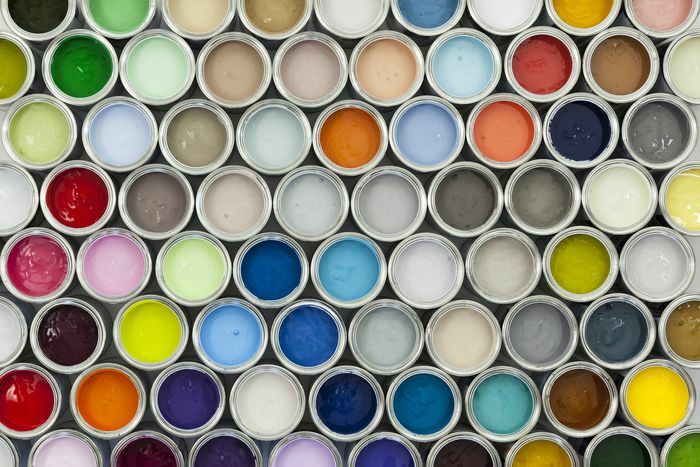 Traditionally, you can either carry around the paint can itself or pour some paint into a painting pail. The traditional metal paint can with a wire handle is pretty uncomfortable to carry around, but fortunately, this kind of can is now becoming replaced by convenience plastic jugs of paint with built-in handles. If you are still using metal cans, however, you might want to think about a convenient tool sometimes known as a Can Claw. The device hooks onto the can and provides a balanced handle to carry the paint around. But even in the best of circumstances, carrying around a gallon of paint while you work at painting trim or cutting in around wall edges is tiring. A variety of paint pails are available, and one of the best is the Handy Paint Pail, available at virtually all home centers and paint supply stores. The pail is small enough to hold a comfortable amount of paint, and disposable liners are available. A magnet built into the side of the pail will grip the metal ferrules on paintbrushes so you can pause to take a break from your work without having to clean up or lay down your brush. Using a small paint pail is much less tiring than toting around a gallon jug, especially when working on a step ladder, such as when painting along a ceiling edge. Dip the brush directly into the paint up to 1/3 of the length of the bristles. This stops the brush from being overloaded with paint and prevents dripping. Tap both sides of the brush lightly against the side of the can or pail. This loads the paint more on the interior of the brush. Do not scrape the paint off the brush by dragging across the edge of the bucket. That just removes the paint, compresses the bristles, and makes the brush ineffective. 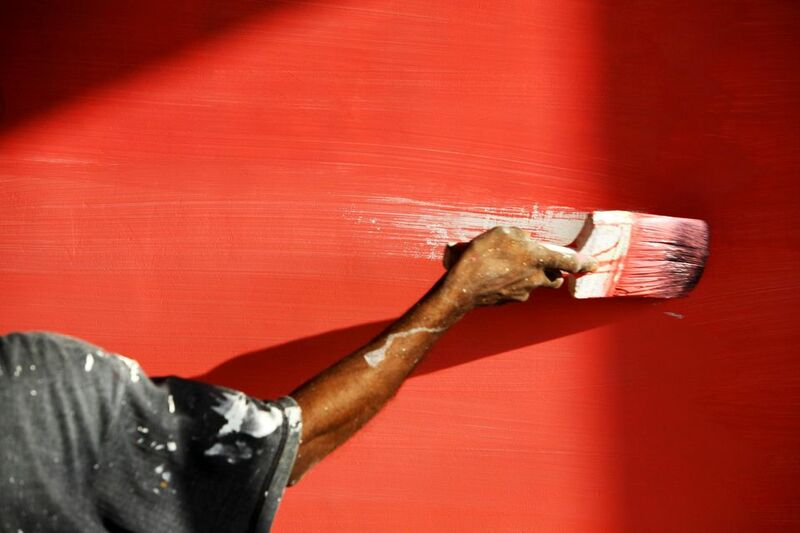 Typically, you'll use a roller for large, flat wall areas and a paintbrush for "cutting in." Cutting in is a term used to describe painting the corners at walls and ceilings and around baseboards and door/window trim. The wall areas not cut in are then painted with a roller or paintbrush. A paintbrush is typically used to cut in because it gives you the most control. If you are rolling the main areas of a wall, you'll begin by cutting in the edges and around woodwork first, before beginning with your roller. If you are right-handed, cut in the wall at the ceiling corners from left to right. If you are left-handed, paint right to left. This will give you visual control over how well the paint is flowing. Holding the brush as you would grip a pencil, press the brush against the wall just enough to flex the bristles, and use the narrow edge of the paintbrush when cutting in. The best cutting-in motion is a series of overlapping strokes, gradually moving along the edge you're painting. Convention has it that if the cut-in corner has two colors (wall/ceiling for example), then you first paint the lighter color, allowing it to slightly extend into the adjoining color area. Then you will cut the darker color over the top of the lighter color. This method ensures that you don't have to worry about the darker color showing through the lighter. If you're painting a larger wall area with a paintbrush rather than a roller, you will use a different technique to apply and distribute the paint. Holding the paintbrush at about a 45° angle and paint the area using several diagonal strokes. Again, press the brush against the wall just enough to flex the bristles. It's okay if the paint goes on a little heavy here. Next, distribute the paint on the large flat area with horizontal strokes of the paintbrush. TIP: We have talked to some professional painters specializing in very high-end clients who choose to paint entire walls using only a paintbrush, without using a roller at all. They say that the faint texture marks created by the paintbrush create a custom look that is much desired. Once the paint is applied and distributed on the wall or ceiling surface, the next step is to smooth it out. This part is all finesse. Simply draw the brush lightly and across in long smooth strokes to even out the painted surface and eliminate brush strokes going in different directions. The rule here is ​"always paint to a wet edge"—this means to never allow the paint to dry completely as you stroke over it with a freshly loaded brush. Doing so will leave you with visible lap marks. At the end of each stroke, lift the paintbrush from the surface. This action serves to slightly "feather" the paint stroke. The quickest and easiest way to store a paintbrush when you'll be back to it within a few hours or even a few days is not to clean it at all. Simply take plastic wrap and tightly wrap the brush bristles. Be careful not to misshapen the bristles when wrapping. A quality paintbrush is a precision tool that can last for years with proper cleaning and care. Use these techniques and other tips to achieve a fine paint job. Spray Paint Walls or Roll Them: Which Is Faster, Easier?